Capriccio showing a ruined interior of columns with pedimented elevations at both ends. An apsidal opening is above a two-bay bridge that links to a terrace with balustrade and sculpture. In the background is a domed building set in a landscape. 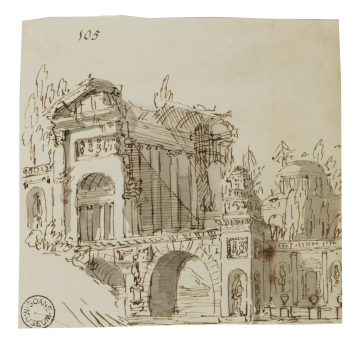 You are here: CollectionsOnline / Capriccio showing a ruined interior of columns with pedimented elevations at both ends. An apsidal opening is above a two-bay bridge that links to a terrace with balustrade and sculpture. In the background is a domed building set in a landscape. The small bridge is a version of that found in the chalk drawing by Jean-Baptiste Lallemand (1716-1803) in Adam vol.55/97 and also Robert Adam's version in 55/107. The diagonal and hatched shadow technique is similar to that in Adam vol.55/90 and 95.